Palestinian Authority President Mahmoud Abbas's gestures toward Syria's President Bashar Assad will only bring him closer to Iran, Hizbullah and radical Palestinian groups that oppose any peace with Israel. Recently, both the Palestinian Authority and Hamas seem to have changed their policy toward the Syrian conflict. Neither Hamas nor the Palestinian Authority wants to be seen as siding with Al-Qaeda-affiliated groups, most likely out of fear that such support would cost the Palestinians Western sympathy and funding. Since the beginning of the Syrian crisis, relations between the Syrian regime of Bashar Assad regime and the Palestinian Authority and Hamas have been tense. Hamas's public support for the opposition forces led to the expulsion of its leaders from Syria; and the Palestinian Authority's failure to support publicly the Assad regime resulted in tensions between Damascus and Ramallah. After losing faith in the Syrian opposition, the Palestinian Authority and Hamas are now trying to mend fences with the regime of Syria's President, Bashar Assad. 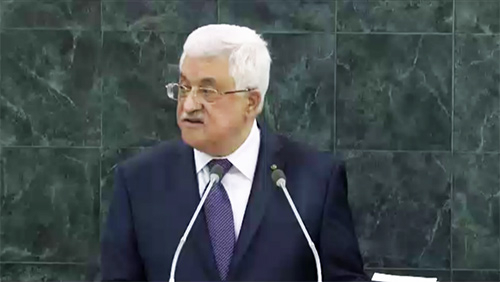 The shift in the Palestinian Authority's stance became evident during Mahmoud Abbas's recent speech at the United Nations General Assembly. Referring to the Syrian crisis, Abbas said, "While we condemn the crime of the use of chemical weapons in Syria, we have affirmed our rejection of a military solution and the need to find a peaceful political solution to fulfill the aspirations of the Syrian people." The Assad regime did not conceal its satisfaction with Abbas's comments, especially his opposition to a "military solution." That Abbas refrained from holding the Assad regime responsible for the use of chemical weapons was also received with a sigh of relief in Damascus. After Abbas's speech, Assad agreed to meet with senior PLO official Abbas Zaki, who relayed to him a letter from the Palestinian Authority president. The Syrian news agency Sana quoted the PLO envoy as telling Assad that the Palestinians support Syria in the face of "aggression." This statement means that the PLO has decided to support Assad against the various opposition groups fighting against his regime. Meanwhile, Hamas's efforts to patch up its differences with the Assad regime have thus far been less successful. In the context of these efforts, Hamas leaders and spokesmen have stopped their rhetorical attacks on the Assad regime. In addition, Hamas has been working hard to distance itself from the Syrian "rebels," particularly those affiliated with Al-Qaeda. In a speech in Gaza City last weekend, Hamas Prime Minister Ismail Haniyeh assured Syria and other Arab countries that his movement does not meddle in their internal affairs. "We never sided with [Arab] country against the other," Haniyeh declared. "We are keen on a unified Arab and Islamic position toward the Palestinian cause." Like Abbas, Haniyeh also called for a "political solution and national understandings" in solving Arab disputes. But while a rapprochement between Hamas and the Assad regime would only serve the Islamist movement's interests and help it rid itself of its growing state of isolation, especially in the aftermath of the downfall of the Muslim Brotherhood regime in Egypt, the renewal of ties between the Palestinian Authority and Damascus does not bode well for the future of the peace process. You must be kidding! Muslims submit to al Shari'iah, the Law of Allah. Making peace with non-Muslims is forbidden and has not happened since Muslims became a people and never will. Just accept this simple fact. "Peace" with Egypt and Jordan is not peace but an extended ceasefire. Both Egypt and Jordan are waiting for Israel to be weakened, so they can defeat the Jewish state. That is why Israel must be strong and why all non-Muslims must support Israel. Hamas, Hizbullah, and the PA are all of the same elk like rats in a nest and at times quite cannibalistic. I have no doubt should push come to shove Assad would not even blink at eradicating either of them. Unfortunately the Palestinian people have been and still are the pariahs of the Arab world. This article shows how shifty both the PA and Hamas are; after Assad killed 2,000 Palestinians and displaced 200,000 others, the Palestinian leadership is eager to reverse its views on Assad in order not to be viewed as supporting rebels linked to Al-Qaeda and risk loosing Western financial support. There is again a lesson for Israel here - you cannot trust an agreement with Palestinian leaders. The PLO/Hamas cannot be trusted by Israel and should not be trusted. By being for Assad, they are for the mullahs of Iran.